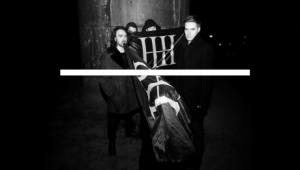 EVEN THE STARS: Track Of The Day : Hartheim - When Did Your Last Rose Die? Track Of The Day : Hartheim - When Did Your Last Rose Die? Manchester's Hartheim have been quiet for a while, but they're back with a new single When Did Your Last Rose Die? They've also announced their first ever headline show at Manchester's Soup Kitchen on April 8th. The single bears all the hallmarks of the little we've heard from them on last year's Yellow and Welcome To Hartheim. Its dark imposing guitars set the scene for a story that tells of the breakdown of a long-term relationship, going from the abandon of young love through its downward spiral into routine and a loveless existence, bordering on hatred, picking over the spoils of what's left. The video, directed by Alexander Bell, continues their desire to challenge the audience visually as well as sonically. When Did Your Last Rose Die? is out now via Jack To Phono on iTunes.